An online shopping portal in India has listed all new tablet from Micromax which features 3G support. The features of the tablet are impressive and as it’s from Micromax so we can also expect a bit of quality. 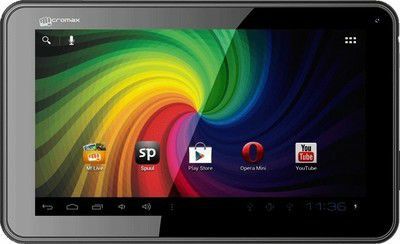 Micromax Funbook P255 HD tablet is the official name and Infibeam has listed it for sale at Rs 4,899 while the original price tag is shown as Rs 5,490, thus offering 11% OFF. Let see what all features Micromax Funbook P255 HD got for users. If you’re looking for an ultra affordable Android tablet in which you can access internet by plugging 3G USB dongle then this can be best option for you. The overall design of the Micromax Funbook P255 HD tablet seems like any other budget priced tablet. It inherits the design from its parent Funbooks and we can’t expect a better design than this at this particular price range. It got in a Cortex A8 processor which is clocked at 1.2GHz and there is also Mali-400 GPU inside to manage the graphics performance in better way. The internal RAM storage is 512MB while for users there is 4GB of inbuilt storage. But only 1.15GB is available for users. Micromax has also provided option to expand the storage using microSD card of maximum 32GB size. Till now, CPU and storage features are looking good. Micromax has claimed that display can support HD videos but I’m not sure of it since its display resolution is just 800×480 pixels. The display measures 7 inch and added on a capacitive touch screen panel. The display supports pinch to zoom feature. To ensure some photographic features, there is 2MP camera at rear and VGA camera at front. So users can also do video chatting using the Micromax Funbook P255 HD tablet. Skype has been already installed in the tablet. For connectivity purpose, Wi-Fi and 3G cellular support is there. The device also got USB port and using which internet can be accessed via 3G USB dongle. Wi-Fi hotspot is also there. Coming to the end, it got 2600mAh battery and Micromax has listed the battery life as 4 hours. The Android version in the tablet is 4.0.4 Ice Cream Sandwich which is already outdated. The tablet is having all required feature but its running older version of Android which isn’t at all impressive. Earlier, Micromax also announced Bolt A40 which was also running an older version of Android. I’m not sure on what strategy Micromax is working now but it can hurt their earned reputation in Indian market.